On February 6th we hosted our annual Faithful Friends Gathering at the Café. This gathering is a time to thank the donors, volunteers, community members, and Recovery Café Members who have made long-term commitments to our healing and life-changing work. The event, highlighted by a moving talk from Killian, an awards presentation to a few of our treasured partners, and Recovery Café Member Pippa’s story, was a wonderful celebration of this place of hope, healing, and life transformation. Please look below for more info on our honorees. 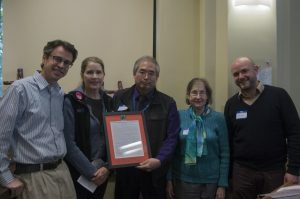 The King County Public Health Reserve Corps (PHRC) is a group of medical and non-medical volunteers, some retired, some still working full-time, who make a commitment to bring health services to hard-to-reach and vulnerable populations. Starting in 2011, this group of doctors, nurses, and behavioral health professionals have come to Recovery Café once a month to lend their expertise around non-emergency medical concerns to our Members. Seeing at least 20-25 Members per month, these volunteers help with a wide array of ailments including blood pressure, rashes and other skin issues, medication concerns/questions, and immensely important foot care, to name just a few. For example, after getting turned away at one location, one Member visited the Reserve Corps volunteers with concern about his eye. The volunteers quickly discovered that he had a torn retina and would have gone blind without treatment. They quickly got him an appointment and his eye was treated. Michael King has been a part of the Recovery Café Community since almost the very beginning of our doors being open. The list of Michael’s contributions over the last 13 years (he first visited the Café during a Coffee Hour in 2005) is too long to cover here but they include: Serving on the Board of Directors, Serving as a Bridge Builder, Teaching various classes and book studies in the School for Recovery, and being a faithful and long-serving barista—Michael has made more lattes over the years than any other single person here. Michael’s sense of humor, kindness, genuine spirit, and commitment to the truth that recovery can and does happen makes him a treasured presence in this community of love, radical hospitality, and life transformation. Lee and Stu Rolfe have been the epitome of the Faithful Friends Recovery Café has been blessed to have on this journey of hope. 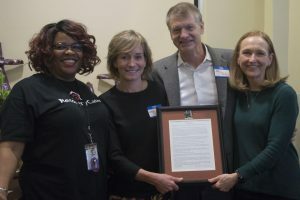 Lee and Stu were part of our first Bridge Builder cohort, they have introduced us to other funders including foundations, and they made it possible for Recovery Café to be featured at and the beneficiary of a luncheon that included a significant number of Seattle’s business leaders. They also have made personal financial commitments to this healing work faithfully over the past 14 years. 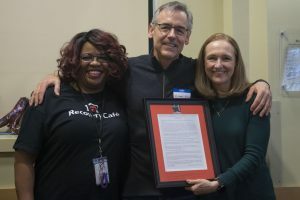 People who put their weight down with Recovery Café and give faithfully year end and year out—like Lee and Stu—made it possible for us to develop the Recovery Café model which is now being replicated in other cities and states. Mike does it all. A Member since Recovery Café was at our old location on 2nd & Bell, Mike has been a steady presence for all those coming to the Café. He has recently become a certified Recovery Coach, he facilitates 2 circles (he’s only missed five, all excused, in the last 4 years), and he’s an active member of the Sole Train Walking and Running Club, running his first half-marathon at the age of 69. But more importantly, Mike is a steady and supportive presence for our Members, especially those who are new to recovery. 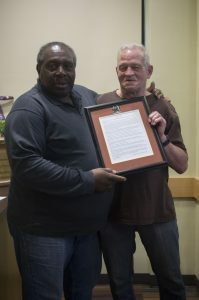 Affectionately known as “Grandpa” because he takes care of everyone, Mike is described as an active listener who is always supportive, always positive, and always ready to work with Members through their troubles. One staff member described Mike as someone who’s a magnet for other members, always in the middle of things.